Born in the Philippines, Laura Balatbat Corpuz grew up with a deep appreciation for academia and the arts. She knew she wanted to contribute to the fields herself, so she obtained a Bachelor of Science in elementary education from National Teachers College in Manila, Philippines, in 1966. Ms. Corpuz spent the next three years as a teacher at Philippine Public School. She really liked her work, but she was looking for something more. When her friend suggested she move to the United States and find a job there, she decided to give it a shot. Ms. Corpuz proceeded to take U.S. history and library courses and completed tests to become a certified teacher in the state of Illinois. She also earned an Associate of Applied Science from Illinois Central College. This propelled her to positions like interlibrary loan assistant at Illinois Valley Library Systems and interlibrary loan coordinator at Bradley University Library. She remains in the latter role to this day. Outside of her work, Ms. Corpuz has been very active in her community. 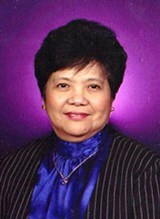 She is currently a charter member of the National Women History Museum, a member of the National Association of Professional Women, a board member of FASCI, a volunteer reader and editor for Peoria Public Radio station WCCBU 89.9, treasurer of Peoria Area Friends of International Students, and board member of the Filipino-American Society of Central Illinois. Additionally, she supports the charitable missions of organizations like the American Heart Association, the American Diabetes Society, Braille Books for Blind Children, Easter Seals, March of Dimes, the Wounded Warrior Project, and the National Federation of the Blind, among many others. When Ms. Corpuz has free time, she enjoys writing poetry, crocheting, knitting, gardening, and arranging flowers.